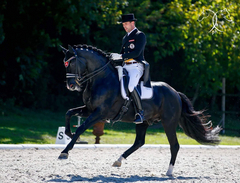 Victoria Max Theurer: Steyr: Stefan wins bronze! What a debut: for his first start at the Austrian National Championship Stefan Lehfellner immediately received a medal. 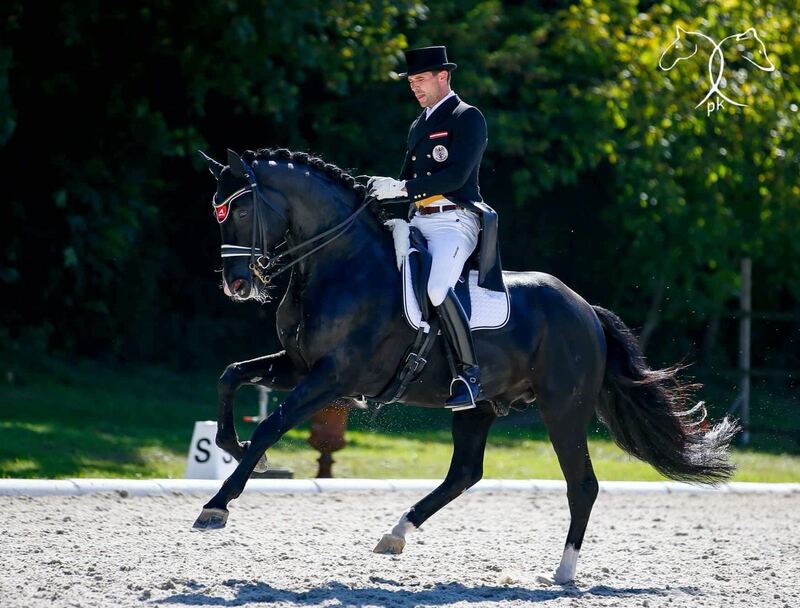 In front of a full house in the riding club Steyr Stefan entered the title race with his favorite, Fackeltanz OLD, and made the third place in the first competition, the Grand Prix. The pair was able to show a fine round: extended trot, half passes, halt, reining back, piaffe, passage – and everything was done with implicitness and a lot of expression, a phenomenal competition start for the pair in its first Grand Prix season. The walk was controlled and with extensive overstepping. As well as the canter: strong, uphill but still with the right amount of control. A slight insecurity during the simple change of leg and during the extended canter cost the pair valuable points, but the foundation was set for the championship! For their freestyle-premiere they borrowed my Augustin-London-freestyle to Phil Collins and were able to claim their right to the podium again: bronze for the two of them directly behind Belinda Weinbauer who was able to win her third title in a row this year with her young horse Auguste MJ, and Astrid Neumayer who sent her 18-year-old DSP Rodriguez into retirement with a silver medal. I also want to thank the competition chief, Valerie Hack, and her team from the riding club Steyr, in the name of Stefan. They worked tirelessly and put their lifeblood into this competition, which was also rewarded with the autumn sun. I also want to thank my mother, who is providing Stefan with Fackeltanz OLD, the recent WEG-double gold winner Isabell Werth. My father who has provided priceless training and tips and the team that has done a fantastic job while working in the background also deserve gratitude. Thank you!